Here are some observations from the Flyers’ victory over the Blackhawks on Thursday night. With Columbus’ loss to Edmonton and Montreal’s victory over the Islanders on Thursday, the wild-card race tightened ever so slightly for the Flyers. They are now five points behind the Canadiens, who jumped over Columbus, for that last playoff spot. The Flyers have eight games remaining. With the victory, their chance to make the playoffs went up a whopping .9 percent, from .7 percent before the game to 1.6 percent afterward, according to Sportsclubstats.com. Corban Knight is the kind of man you hope your daughter brings home. The man own an eternal smile to accompany his pleasant disposition, even when sporting a fresh gash over his nose — compliments of his visor crashing down on it amid a scrum after a faceoff. "So what happened to your nose?" he was asked. “What’s wrong with my nose?" he deadpanned, again with a smile. ”I didn’t think it was that noticeable." Knight scored his first NHL goal since potting one as a Florida Panther three Januaries ago when he tied Thursday’s game in the first period with a wrist shot from the slot. It’s been a trying journey for him, spending all of last season with the Phantoms, where he was continually described by then-coach Scott Gordon as “one of my glue guys.” And always with a smile. He nearly had a second goal later. "I’ve had my chances," he said. "It was nice to see one go in." They’ve taken a ton of criticism throughout the inconsistent, up-and-down seasons that have marked their Flyers careers. But beyond Claude Giroux, several of the Flyers most grizzled veterans have stepped up big time during their run to relevancy over the last two months. Sean Couturier had a goal and an assist in Thursday’s victory. He has 40 points (15G, 25A) since Jan. 9, a span of 31 games. He is plus-24 since then. James van Riemsdyk has 20 goals over his last 31 games and is a plus-22 during that time. He’s so hot right now that he scores even when he’s not really intending to, like when he flipped a backhander on net midway through the third period Thursday and it ended up providing the game-winning margin. Not to be overlooked, of course, is what Giroux and Jake Voracek have done over that span, too. Both players assisted on goals Thursday. Voracek passed to Couturier through the neutral zone as he headed to the bench for a chance set up JVR’s game-winner. 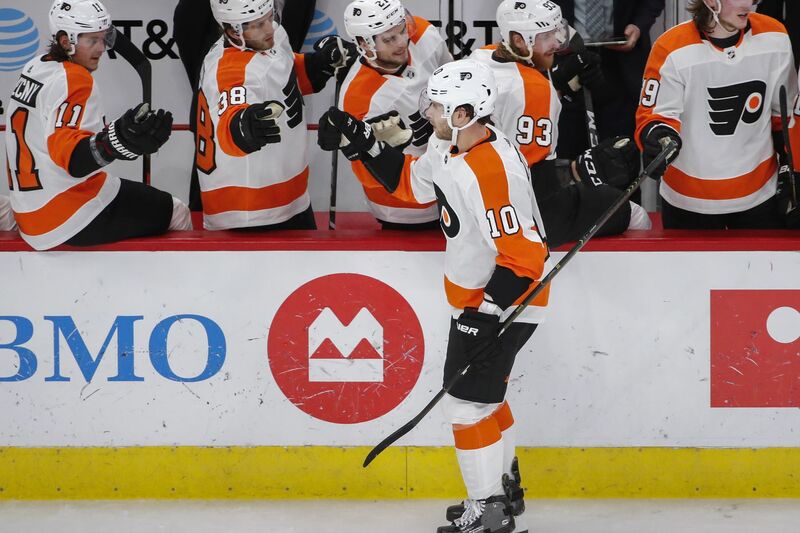 Giroux, the team’s leader and among its most unselfish, drew two defenders and laced the pass that Couturier guided into an empty net for the third goal. A lot has been made about the Flyers’ improved penalty kill under Scott Gordon. But one reason for it is they haven’t taken as many penalties since Jan. 9. Including Thursday, they have been shorthanded 73 times since then, and they entered that Blackhawks game tied for fourth fewest in the league over that stretch. Before that, they had been shorthanded 137 times, which put them among the 10 most penalized (ninth).